Consider the recent 150,000-square-foot expansion and renovation of The Fashion Mall at Keystone, an upscale shopping center owned by Indianapolis-based Simon Property Group. In February 2012, work began to modernize the center’s design, accommodate new store space and develop a new food court. As with most retail facilities, the mall needed to stay open for regular business hours during construction, but its timeline was especially short. The installers needed to lay the tile, set the mortar and apply the grout in just 10 hours. The installers worked during the night, laying tile in the mall concourses, food court and restrooms while the mall was closed. 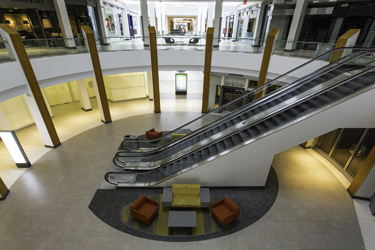 Thanks to Fast Set Ultimate Large Tile Mortar and Power Grout, they were able to complete the installation before the mall reopened the next business day. We introduced Fast Set Ultimate Tile Mortar, a fast-curing version of our large tile mortar, last year knowing that when it comes to tile installation, commercial facilities need to work with speed. In addition to setting quickly, Fast Set Ultimate Tile Mortar provides non-sag and non-slump characteristics, contains recycled materials and exceeds ANSI A118.4 and A118.11 shear bond specifications. Power Grout is designed to address many of the issues installers have with traditional grouts, including color fading, staining and efflorescence. In addition to offering appearance benefits, this high performance grout exceeds ANSI A118.7 specifications and is fast setting, allowing for foot traffic within four hours after installation. The Fashion Mall at Keystone renovation and addition began in February 2012 and was completed in November 2012. The project team included architect Ratio Architects, Indianapolis, IN, installer Santarossa Mosaic & Tile Company, Inc., Indianapolis, IN, and distributor Louisville Tile, Indianapolis, IN.